The Railway Club for me and my friends was a refuge in Vancouver for at least 20 years. We had a noon-on-Thursdays get together lunch where photographers, writers, illustrators and the occasional ecdysiasts would converse in leisure. The group finally dissolved (all good things do) and I never returned. But recently I became curious. The club is no longer run by the children of former NDP Minister Bob Williams. Whoever has purchased the club has renovated the place.They removed the ratty carpet and and cleaned it all up. One element of the former club has not changed. Food is good, especially the soup. One of the extras we had at the Railway Club is that we were kitty corner with the St. Regis which had a Grade–B calibre exotic dance club. It was in one occasion when I saw a dancer that had very long hair. 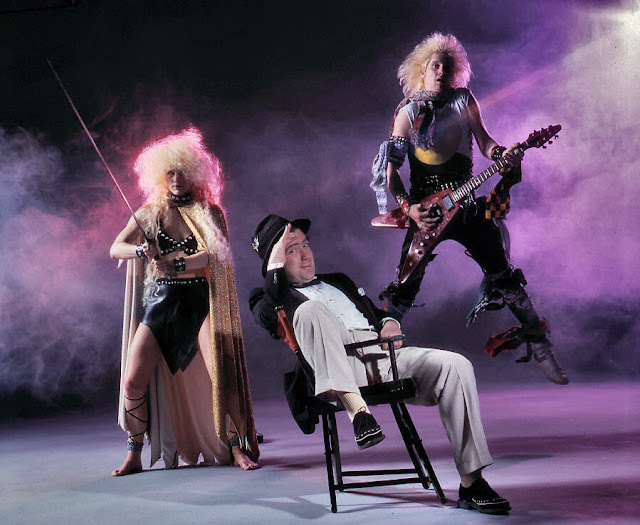 I persuaded her to pose for a shoot involving Randy Rampage (on bass) and Doug Bennett of Doug & the Slugs fame. She said yes and best of all I managed to have Vancouver Magazine pay her an honorarium. I have forgotten her name. During the photo session she confessed that her long hair was an extension. In those days of competition between magazines and newspapers the photographs had to be spectacular. You may note that for this shoot I had to rent two smoke machines.